TORONTO, ONTARIO — Nestled among the brick houses of this city’s Wychwood neighbourhood, visitors will find a community centre, park, and artist studios. The difference with this site is the transformation from a derelict warehouse used as storage by the Toronto Transit Commission to a space filled with creativity and laughter. The Wychwood Barns, located in Toronto’s mid-town area, a block south of St. Clair Avenue West and on Christie Street, has become a model for a new view of enriching an urban community via art. Built between 1913 and 1921, the five brick buildings that make up the Wychwood Barns were a main hub of Toronto’s transit system, acting as streetcar houses until 1978. By the mid-1980s, the barns were vacant, 4.3 acres left desolate in the growing city. In 2004, the City of Toronto and Artscape began to reimagine this block, preserving the historical buildings and accepting direction from the surrounding community, who had participated in a series of consultations during 2002 and 2003. Construction began in 2007 and in November 2008, the official opening of the Wychwood Barns presented a new face — one that included a 60,000-square-foot centre, with 26 artists and families in live/work studios, 17 artists in studio spaces, office spaces for 11 non-profit organizations, daycare, a monthly arts market, an art gallery and a 127,000-square-foot park with picnic tables, volleyball court, fenced off-leash dog park, and an ice rink. STOP Community Food Centre has also become a partner in the development, resulting in food education programming, a greenhouse, outdoor oven, community gardens reflecting the multicultural mix of the neighbourhood, and the creation of a weekly farmers’ market, now happening every Saturday that’s a draw for residents and visitors. The project has also inspired other revitalization projects throughout the country, including in Calgary and Saskatchewan. This heritage building was the first to seek LEED Canada certification, and has become a model for integrating the old and new, as well as providing residents with myriad community activities, and making art a priority. An artist studio occupant since its opening, artist and children’s author/illustrator Cybele Young, has welcomed being part of the Wychwood Barns community. “It’s been a benefit to my life/work balance to be able to walk to work,” explained Young, who kept her eye on the development as a resident of the neighbourhood. Young has used the gallery space twice for her own exhibitions and book launches as well as collaborated with fellow Wychwood Barns’ neighbour Theatre Direct in its Family Sunday series, an example of the grand dreams that planners had hoped would happen — having a place for creative talent to develop and collaborate. Other arts groups that call this unique place home include New Adventures in Sound Art, b current, Latin American Canadian Art Projects and The Storytellers School of Toronto. 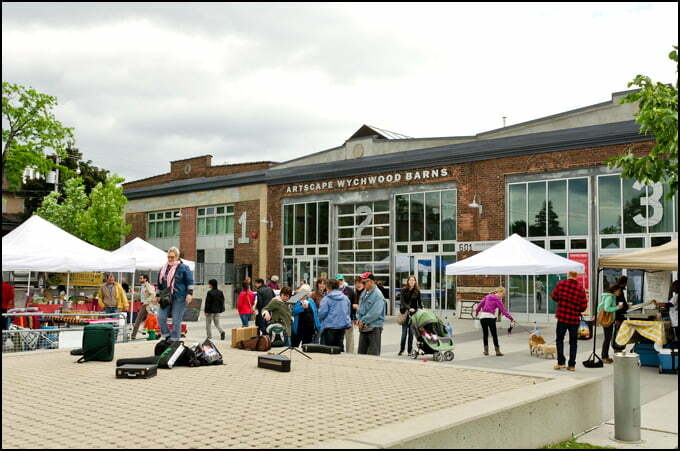 From yoga classes and art exhibitions to participation in Toronto arts happenings such as the Contact Photography Festival and Nuit Blanche, the Wychwood Barns is committed to bringing more artistic endeavours to their local residents. Directions: To get to the Wychwood Barns via Toronto Transit Commission, ($3 one way) visitors can take the University subway line northbound to the St. Clair Avenue West station, and either hop on the westbound #512 St. Clair/Keele streetcar or walk 10 minutes to the Wychwood Barns. An alternate is to take the subway westbound to Christie subway station and take the Christie 126 bus north to Benson Street, one block south of St. Clair Avenue West. Complimentary parking is available too.